QualiMed’s sirolimus-eluting coronary stent is available under CE Mark only and is not approved in the United States. First-generation drug-eluting stents (DESs) deliver high clinical efficacy at the collateral cost of delayed healing of the stented arterial segment.1 Although DESs and their respective technology have been extensively documented, the discussion has often centered around the type of drug and not necessarily the technical theory behind the stent design. Figure 1. High-speed bombardment of C+ ions under vacuum onto alloy’s surface. 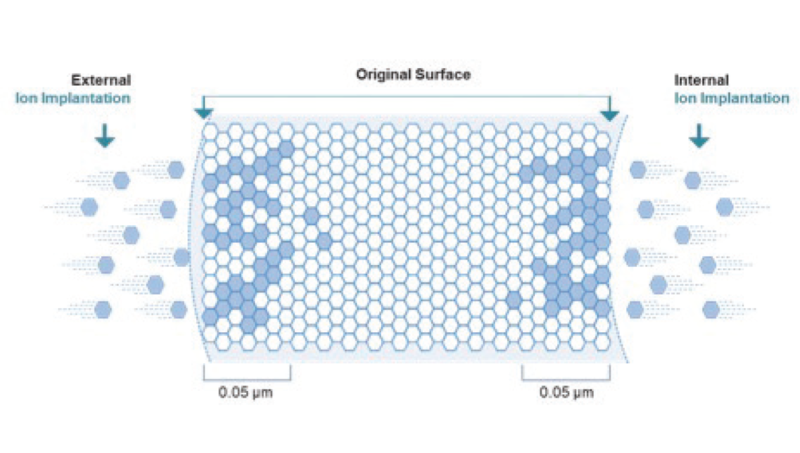 The carbon ions are shot onto the stent’s surface with high energy under vacuum and subsequently penetrate it. This methodology allows the carbon ions to occupy free spaces or displace heavy metal ions such as nickel or molybdenum within the lattice itself. Due to their high electronegative force, surrounding atoms become attracted to the C+ ions. Because carbon is highly biocompatible and easily incorporated, these features are conferred to the alloy. As DES technology continues to evolve, we must be critical not only of eluted drugs provided on the stents, but also the physical properties of the alloys and coatings and their effect on vascular healing. 1. Byrne RA, Sarafoff N, Kastrati A, Schömig A. Drug-eluting stents in percutaneous coronary intervention: a benefit-risk assessment. Drug Saf. 2009;32:749-770.
stent restenosis [published erratum appears in Lancet. 2001;357:316]. Lancet. 2000;356:1895-1897. 3. Joner M, Nakazawa G, Finn AV, et al. Endothelial cell recovery between comparator polymer-based drug-eluting stents. J Am Coll Cardiol. 2008;52:333-342. 4. Angioplaty.org. Abbott’s XIENCE PRIME™ and Xience V® drug eluting stents receive indication in Europe for minimum 3-month duration of dual anti-platelet therapy [news release]. Published May 15, 2012. http://www.ptca.org/news/2012/0515_XIENCE.html. Accessed November 13, 2017. 5. Templin C, Meyer M, Müller MF, et al. Coronary optical frequency domain imaging (OFDI) for in vivo evaluation of stent healing: comparison with light and electron microscopy. Eur Heart J. 2010;31:1792-1801. 6. Murata A, Wallace-Bradley D, Tellez A, et al. Accuracy of optical coherence tomography in the evaluation of neointimal coverage after stent implantation. JACC Cardiovasc Imaging. 2010;3;76-84. 7. Data on file, QualiMed Innovative Medizinprodukte GmbH.